The New York Jets put an end to the Le’Veon Bell Sweepstakes late Tuesday night, signing the superstar back to a four-year, $52.5 million deal and pairing sophomore Sam Darnold with game-changer in the backfield. With rushing production more dependent on factors outside of the ball carrier’s control, running backs are largely replaceable in today’s NFL and, therefore, investing significant draft capital or cap resource into one back is dangerous if interested in a positive ROI. Bell needs to be the best running back in the NFL and then some for his value to come close to cash now brimming his pockets. Bell, of course, had ample suitors on the free market because he’s capable of such production in the NFL. Prior to sitting out the 2018 season, Bell earned 71.6-plus overall grades in every season since getting drafted in the second round in 2013. In three of the five seasons, Bell topped 1,300 yards and 70 combined first downs and touchdowns on the ground while also logging more than 600 receiving yards through the air. 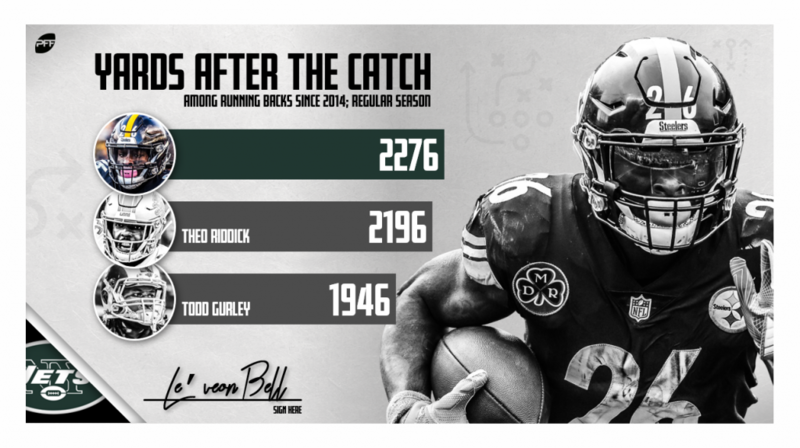 In Bell’s career-best season from a rushing production standpoint (2016), he forced 54 missed tackles and averaged 3.05 yards after contact per attempt en route to an 80.1 rushing grade. And in 2014, Bell’s best season as a pass-catcher, he recorded career-high marks in forced missed tackles on receptions (29), passer rating when targeted (108.1), receiving first downs/touchdowns and total receiving yards (854). Getting similar production from Bell in New York will require two things relatively outside of his control: A clean bill of health and a heavy market share in the Jets’ offense. Bell has played 900-plus offensive snaps in three of his five years in the NFL and only fell victim to significant injury in 2015 (ACL). He also proved in the two subsequent seasons after his injury that he’s still capable of thriving with a high snap count. Paying Bell $52.5 million over the next four years should push Adam Gase & Co. to rename half the plays in Bell’s honor let alone feed him the ball on a regular basis. All signs point to Bell getting the lion’s share and then some of the touches in Gase’s offense, especially given the lack of talent outside of their newly signed, much richer running back. Stay up to date with our live free agency coverage via our 2019 NFL Free Agency Tracker all throughout the week.